Emily Alexander has a magical secret... she works for Santa at The International Elf Service. She is also a Registered Osteopath and a Mum to a wonderful little boy who has Down's syndrome and sensory processing disorder. Here she charts the almost miraculous effects of Sensory Occupational Therapy on her son's balance, fine motors skills and speech after just three weeks of targeted therapy. As she points out, this intervention would not suit all children, but if your child is displaying some of the same symptoms, it might be worth investigating. Please welcome her to Special Needs Jungle where we thank her for this informative and useful post. You can read more about her son's journey over on her blog Sensory Processing Disorder and Our Boy with Down's Syndrome. So what is Sensory Processing Disorder and who 'gets it'? All day, every day, we receive information from the world around us via our senses – food we bite in to, things we touch, what we see, smell, noises we hear and so on. Our nervous system is constantly assessing all this information and generating appropriate physical responses. Everything we do requires us to incorporate sensory information into meaningful and successful interactions with the environment. I personally can’t stand being sticky, having a hat on my head, the feeling of socks slipping down over my heel in trainers, the kids asking me questions all at once, not getting any down time in a day/evening and there’s more to my list. In fact, I dislike these things SO much that when they occur, I just can’t think of anything else and I have to resolve them IMMEDIATELY. I just can’t function. If I was a child I might deal with the ‘too many people talking at once thing’ by crying / hitting whoever was closest / shouting / banging on the table / have a tantrum / start wringing my hands… in these situations, their fight and flight (sympathetic) nervous system is too active and they need help from their rest and digest (parasympathetic) nervous system to calm them down and help them function normally. Many children have very different tolerance levels with a reduced ability to integrate the information their nervous system is receiving. Some don’t realise they’re having a sensation overload (or under-load) or what it is that’s upsetting them or making them feel bored. They just feel stressed / need to hit / shout / blow raspberries all day / have a tantrum / go to sleep / behave erratically / find it hard to keep their balance / want to be by themselves / want everyone to play with them all the time….etc Their nervous system is in overload / underload and can’t function properly. The behaviour that then ensues (often seeking some kind of sensory input) can be unhelpful to them, antisocial and more importantly, blocks them from learning and progressing to reach their potential. 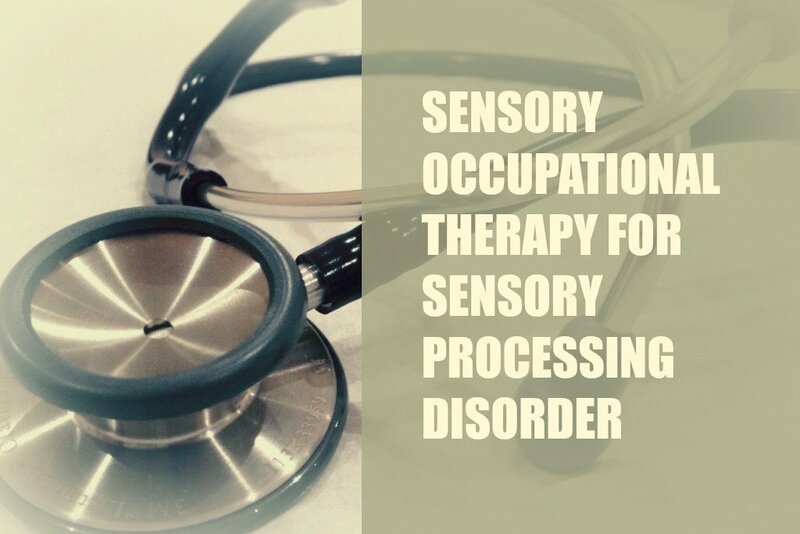 Speaking very basically, Sensory Occupational Therapy aims to improve the balance between the fight and flight part of the nervous system (the over excited/ shouty / whizzy part) and the rest and digest (calm, sleepy, slow) part and improve the way that sensory information is processed by the body. I’m very interested in this personally and professionally. I see so many children who aren’t fully at ease with their environments or functioning as well as they could: my osteopathic training has taught me to get to the cause of something and not just treat the symptoms. I’ve always had a very keen interest in physiology and how bodies work and applying that to my clinical practice (I also have an Honours degree in Neurophysiology from Bristol and was a trainee Cardiac Perfusionist (running the heart lung machine during open heart surgery) at Barts Hospital in London). There really does seem to be a reason for everything and if you or your doctor doesn’t know what’s going on, there absolutely will be someone somewhere who does. If your child has a label (like Down Syndrome for example), please don’t accept – ‘oh it’s because they have Down Syndrome, there’s nothing we can or would do about that, it’s just the way it is.’ I will write more about this in future posts but please be curious. What’s actually going on and can you find someone to help you look at the bigger picture to see what the cause might be and if it’s something you can follow up / get help with. I thought it might be helpful to some people to hear about Sensory Processing Disorder & our boy with Down Syndrome and our experiences with a Sensory Occupational Therapist (SOT). It goes without saying that what is right for our child may not be right for yours but you may see some similarities or be intrigued enough (I hope) to look into it more. Our youngest son is almost 4 and has Down Syndrome and is mainly a very delightful and engaging little boy with a keen will to learn. He’s been finding a few things difficult, which have been slowing his progress. His main difficulties have been his shocking balance (would fall over an eyelash), speech difficulties, really not keen on the TV/noisy unfamiliar places, problems with some fine motor skills and going through various phases of throwing things. Very wobbly on his feet though he’s been walking for 18 months, needed lots of hand over hand help putting jigsaw pieces together and other fine motor activities, struggling to copy sounds accurately and was just starting to say 2-part words, would get frustrated with anything he was finding hard and want to stop, we had to repeat instructions until he’d followed them. No sign of potty training. When he’s feeling under-stimulated (can’t get sounds/ words out, falling over / wobbly, fumbling with motor tasks, day dreaming): we stimulate him and then redo the same task he was having trouble with or a similar task. This all seems too simple and too good to be true but actually it really does seem to be working and we haven’t been able to do it 100% of the time at all. The theory is that over time he will learn to self regulate, integrate more appropriately and his tolerance levels will become more reasonable. His nervous system will reset. It will affect all of him and as a result, there will be improvements in all areas. Us humans aren’t built in different sections, we’re whole beings where everything is linked to everything else. Our SOT describes it as a sensory fog that we need to lift so our boy can do what he’s actually capable of. What a blessed relief to have all this described so clearly and helpfully. I hope it is ok to share this? My son is 14 and we came to sensory OT when he was around ten. IT HAS TOTALLY TRANSFORMED EVERYTHING. For us learning the root of our sons ‘challenging’ (baffling) behaviour has been such a relief. That we can now prepare him, and his environment with reasonable adjustments is so enabling and freeing. That we can describe what works and what doesn’t to school, family and friends has transformed his experience of all these. From being a bit locked into himself, he has emerged as a kind, charming, friendly Young man. His confidence has blossomed and he is much much much happier. What has been the most rewarding thing for me is that his speech and language has become more clear and functional. Sentences – conversation – even word play!! Thank you for this blog. So much. The things that have helped and changed are that he had aural therapy (the listening programme) that taught his brain sound depth/distance perception) which has hugely reduced his anxiety over loud noise and busy places. He has a weighted blanket – which seems to help him stay in his bed until he falls asleep. He has lap pads which anchor him at table – lengthening his concentration and reducing anxiety. He has a wobble cushion on his chair for same. We administered the brushing programme which I think has made the most tremendous difference to his anxiety levels – he just is not so anxious about things touching him. And he clearly doesn’t anticipate so much pain (from unexpected light touch). He is more calm, more receptive, more present, more conversational. Now we are hoping that daily intervention will lead to him being able to recognise his own symptoms and be able to manage them with sets of exercises and/or activities. We work with pioneers in sensory integration therapy based both here and abroad and many of our children benefit from therapies and interventions. However, where possible we try and ensure that not only do they get professional support but they also get what they need from their natural environment and local community. For example our balance board therapy which we run in schools before and after school has led our children onto trying sup boarding, skateboarding, dance, cricket, football and marshal arts. Our listening therapies have led onto our young people developing a real passion for writing poetry and stories or realising that they are gifted singers. One autistic young person was found to be pitch perfect. What we try and do is ensure that long after our children stop their therapy sessions they have begun to integrate its benefits into their everyday life and across all its domains. This means that they continue to be motivated to do what we know is good for them. For example my son who has ADHD amongst his many labels now displays little evidence of this according to the health and educational professionals involved in his care. This is because he has had a menu of sensory integration therapies that have now been moved into his everyday life. For someone who was glued to the internet, he now spends most of his time longboarding and sup boarding and generally enjoying the outdoors. He is a learning ambassador for his school. We are working with young people, parents and carers, schools, health, education and social care professionals and have created a pipeline from therapies and interventions into everyday well being. Thank you for sharing what is proving to be such a much sought after set of information. Welcome to SNJ. As a psychotherapist working with children and adults with autism, I know that sensory processing challenges co-exist very commonly with autism. I think the biggest challenges adults with autism may have is finding licensed occupational therapists who are willing to treat adults as well as children.